The landlocked East African country of Uganda is making Jewish history this year: It is the 100th country to welcome a permanent Chabad-Lubavitch presence in its midst. In October, Rabbi Moishe and Yocheved Raskin, along with their young son Menachem Mendel, moved to the country’s capital city of Kampala, where they established Chabad of Uganda. The milestone was marked with a formal announcement on Sunday evening at the annual International Conference of Chabad-Lubavitch Emissaries (Kinus Hashluchim) in New York. Other countries where Chabad is establishing new permanent presences this year include Montenegro, Nassau in the Bahamas, and the tiny Caribbean island of Curaçao. These countries followed the recent opening of Chabad Houses in Laos and the Pacific island of New Caledonia. “Having centers in 100 countries is a momentous achievement and gives us a permanent way to constantly be in touch with Jews in every single one of these countries,” says Rabbi Moshe Kotlarsky, vice chairman of Merkos L’Inyonei Chinuch—the educational arm of the Chabad-Lubavitch movement—chairman of the conference and a key person behind Chabad’s expansion into Jewishly uncharted territories. 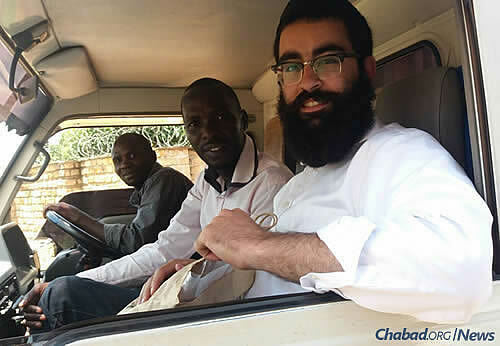 Chabad has had contact with the small but dynamic Jewish community in Uganda since at least 1999, when Rabbi Shlomo Bentolila, who together with his wife, Miriam, heads Chabad of Central Africa in Kinshasa, Congo, first sent “Roving Rabbis” there for the summer and to help mark Jewish holidays throughout the year. The country has come a long way since the dark years under the thumb of dictator Idi Amin (1971-79), who in 1976 famously allowed a plane that had taken off from Tel Aviv and was hijacked by Palestinian terrorists to land at Entebbe Airport. The episode culminated with the Israel’s miraculous Operation Thunderbolt, when Israeli commandos surreptitiously landed in Uganda and freed 102 hostages. The operation’s commander, Yoni Netanyahu, the older brother of Israeli Prime Minister Benjamin Netanyahu, was killed during the rescue. In recent years, stability has been the rule in Uganda, which has seen an influx of international business. Today, some 400 Jews, mostly Israelis, live there year-round, joined by Jewish diplomats and NGO staffers from around the world. “The time was right to establish a permanent Chabad House there,” says Bentolila, who arrived in the Congo with the Rebbe’s blessing in 1991. The Raskins, both from Israel, traveled to Kampala for Purim and Passover, running holiday programs there before making the decision that the country would become their permanent home. The International Conference of Emissaries brings together 5,600 rabbis and their guests from around the world, from as far off as Stalin’s Jewish Autonomous Region of Birobidzhan, in Russia’s Far East, to Staten Island and now, Uganda. The new generations of emissaries will join those who have gone out before them. Back in 1950, when the Rebbe assumed leadership of the Lubavitch movement following the passing that year of his father-in-law—Rabbi Yosef Yitzchak Schneersohn, of righteous memory—the first country he sent emissaries to was Morocco in North Africa, which had a significant Jewish population at the time. Kok hakovod to the Raskins and much hatzlacha to them and all the other new chabad shalichim.